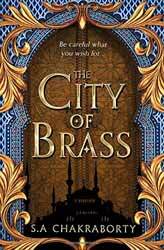 The City of Brass (2017. 532 pages), is a new fantasy novel from S. A. Chakraborty and the first book in her Daevabad Trilogy. The book is told from two perspectives, that of Narhi and Ali and the chapters are named for whichever person we are spending time with. The thing I liked the most about the novel was the characters. Each of them is well drawn with understandable motivations and in their own way all of them believe that what they are doing is right and just. That is not to say that the author has not created them without complexity or conviction. Nahri’s disbelief in magic is quickly shattered when performing the sham zar incantation, which releases not only an evil Ifrit spirit, hell bend on killing her, but also Dara, a djinn warrior who spirits her out of Cairo and onto the fabled city of Daevabad. Along the way they are threatened and harried by Ifrit until finally making their way to the safety of the city. Ruled by King Ghassan ibn Khader al Qahtani, defender of the faith, the city is a mosaic of competing tribal tensions. His second son, Prince Ali, is a deeply religious young man who abhors injustice and does what he can to relieve the injustices heaped upon the Shafit, creatures that have mixed djinn and human blood. His naive attempts to help place him at odds with his father and family and decisions that he makes have wider consequences than his intentions. The city and world have a richly detailed history. Originally the djinn were creatures of great power, each tribe associated with one of the four elements. However, for their arrogance they were thrown down, cursed to inhabit human bodies and though they live for many hundreds of years, their magic is diminished and like the humans they could know death. When Nahri reaches the city she is hailed as the last of the Nahid’s the tribe of great healers who used to rule the city. Chakraborty is a Muslim and she has woven a lot of middle east myths and legends into her book, it would be easy, but lazy to say that it is a modernising of One Thousand and One Nights, while the book does contain Genii’s, magic artefacts and fantastical beasts, the book has more in common with George R. R. Martin’s love of character and intrigue. The relationship between the characters, whether they fall in love or become bitter enemies, always comes out of something understandable. She presents complex creatures of emotion, even when things go wrong for them you can still empathise with what they were trying to achieve. Another strong point, and we go back to complexity again, is that there are no heroes and no obvious villains. Chakraborty eschews polarising motivation and action into easy and conveniently digestible portions. I really liked the book and very much look forward to reading the next. This was strong storytelling with compelling characters and a world you would be happy to spend many hours in.